KKInstruments is a world leader in the design, development and manufacturing of portable test and measuring instruments. 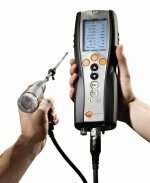 We are recognized as the leading worldwide manufacturer of portable combustion efficiency analyzers. Made in Germany.